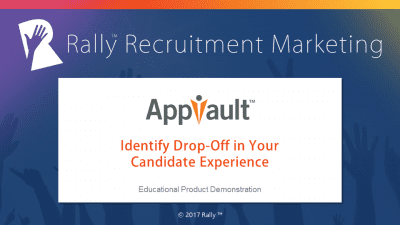 AppVault‘s Dave Tuttle and Rally’s Lori Sylvia discuss how to identify where applicants may be dropping off during your candidate experience. Dave walks us through an example of Coca-Cola’s career site and explains how images, dynamic content and calls to action can help guide candidates through their journey, how to interpret drop-off points, and what you can do to improve your response rates. Length: 28 minutes.